Mass casualty school shootings are neither a new phenomenon nor a type of violence unique to American schools. Though American school shootings predate the Civil war, the first mass casualty school shooting in an American K12 school we have identified took place in a Newburgh, New York Parochial School on April 19, 1891. A 70-year-old man shot five students with a shotgun in this attack. Just more than a decade later, an elementary teacher shot and killed three trustees of a Mennonite School in Canada before going across the street and shooting their three children to death. Tragically, mass casualty school shootings have also occurred in Argentina, Austria, Australia, Brazil, Canada, China, Finland, Germany, India, Israel, Mexico, Nigeria, Russia, and Scotland, just to name a few countries. School and police officials have expressed concerns about school shootings in every one of the more than two dozen countries our analysts have worked in. To dispel another common myth, attackers have used firearms, edged weapons, gasoline, swords, clubs, hatchets, explosives, a homemade flamethrower, and other weapons to carry out mass casualty school attacks in the United States and many other countries as far back as 1764. In fact, there is no region of the world that has been left touched by the types of extreme violence in K12 schools. While many pundits, special interest groups, vendors, elected officials and individuals with the very best of intention suggest an array of simple solutions, there are actually no examples of any singular approach that has been proven to eliminate mass casualty violence in schools. While it is a healthy and natural part of our culture to discuss and debate potential strategies to further reduce the number of homicides in our schools, it is extremely important that schools do not overlook the measures that have been repeatedly used to successfully avert planned school shootings while seeking new protection measures. While schools consider an array of new theoretical but as yet not validated approaches, it is imperative that student threat assessment and management, suicide prevention and other proven behavioral prevention measures be more widely utilized. While there are no simple answers nor 100% effective approaches to prevent school shootings, there are approaches that have been used to successfully avert hundreds of planned and imminent school shootings. While every school homicide is one too many, we cannot lose sight of the fact that multiple planned school shootings are successfully averted for every successfully carried out attack. While we continually hear about the “good old days” when mass casualty school attacks were not a concern, history provides many examples of horrific attacks from colonial times to the present. The 24/7 news cycle and the development of the internet make us painfully and almost instantly aware of horrific attacks that in the past did not receive national attention. Keeping in mind that there are more K12 students in U.S. K12 schools each day than there are human beings in Canada and Australia combined can also provide a more accurate perspective. As with child molestation by school employees and staggering numbers of fatalities from drunk driving prior to the efforts of Mothers Against Drunk Driving to educate us, we are far more aware of homicides in K12 schools than we were when a school board member carried out a deadly bombing of the Bath School in Michigan killing 43 students and staff in 1927. It is also important to remember that our nation’s most lethal K12 attack occurred at the Our Lady of Angels Sacred Hearts school in Chicago in 1958 when a troubled elementary child killed 95 students and staff with a book of matches. While we seek new ways to make our schools safer, it is at serious risk to our students and those who educate them for us to invest considerable time, energy and fiscal resources on theoretical measures while ignoring proven measures that have repeatedly prevented deadly school shootings and bombings over the past three decades. It has been a true privilege to be able to work with five really outstanding groups of participants in a train the trainer program for the South Carolina Department of Education this month. We feel honored to have been selected by a competitive bid process to develop and present the five modules for this initiative across the state of South Carolina. We have been impressed to see school superintendents, business officers, operations and facilities directors, risk managers, student services, mental health, security directors, and law enforcement officers dedicate two days of their time for these information rich discussions. We researched and updated each of these topics and customized them to fit the needs of the South Carolina Department of Education and the school districts they serve. The Department has completed two prior projects to provide training for school staff and their community partners in school emergency planning. The – train the trainer programs were designed to help participants train personnel, conduct scenario-based building and district level drills and exercises to test the fidelity of their prevention, preparedness, response and recovery plans. The program was also designed to help districts improve their approaches to documentation of safety efforts to reduce civil liability exposure, risk of reputation damage and most importantly, to help prevent injury and loss of life. The participants have each been provided with multimedia presentations for each of the five topics, planning and evaluation tools, and more than 30 school crisis video and audio scenarios. The focus of this program has been on providing tools to help the instructors not only provide high-quality scenario-based training, but also with ways to help obtain buy-in from school employees. This last point has been one of the biggest challenges school safety personnel face. The use of scenarios in each of the five modules are designed to help school officials and their community partners understand their risks, identify gaps and identify appropriate and realistic opportunities for improvement. We are thankful to have had the opportunity to participate in a variety of statewide school safety initiatives in South Carolina, North Carolina, South Dakota, Hawaii, Indiana, Maine, Wisconsin, Pennsylvania, and the District of Columbia. These programs afford excellent opportunities for Safe Havens to have a much broader and meaningful impact on school safety, and we feel truly blessed to work with state agencies on these exciting projects. Most school security directors, police chiefs, risk managers, and other professionals tasked with creating and maintaining school safety will tell you that one of the biggest challenges they face is obtaining buy-in for school safety measures. This is one reason many school safety leaders push to get their organizations to incorporate passive design features like crime prevention through environmental design (CPTED) while also attempting to get security cameras and other technology solutions. With the many success stories of CPTED in the school setting and the truly amazing improvements in school security technology, these can be wise investments. Smart camera technologies with remarkable video and audio analytical capabilities and proven design features can go a long way to create safer schools. However, these assets are much more reliable when they are combined with a well-informed and highly motivated team of administrators, teachers and support staff. Safe Havens has been working closely with the South Carolina Department of Education on a series of five school safety train the trainer programs with a focus on providing tools for South Carolina school districts designed to help address the critical human aspect of school safety. Using a system of more than 50 carefully scripted video and audio school crisis scenarios; this project has been extremely well-received thus far. The training series provides staff with a variety of options for interactive staff development activities combined with a modern approach to school drills and district-level implementation of a comprehensive drill program. The result is that South Carolina school officials can now more easily build interest and support for their written policies, plans, and procedures by providing staff with scenario-based activities that provide a strong impact on trainees. Our experience has always been that a few minutes of scenario-based training can accomplish more than a year of staff development sessions that fail to grab your attention and result in no buy-in from staff. As the cost of the entire statewide program is less than a school security camera system for a single elementary school, the return on the time, energy, and effort will be significant. As schools can, and when possible, they should continue to implement these highly robust school security technology and building design concepts. They should also be sure to keep up efforts to develop school employees that are just as high-tech – using human factors. The combination of great physical safety and security measures and an increasingly competent workforce can improve on the impressive advancements in school safety we have witnessed over the past three decades. While there are significant on continually evolving school safety challenges, we have never before had the quality of human skill sets and physical safety options to get the job done. To me, the progress is remarkable, meaningful and timely. 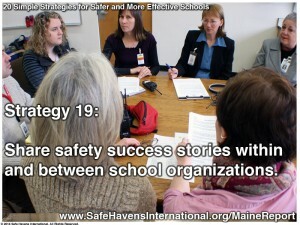 One great resource for building school safety support internally is Safe Havens’ report “20 Simple Strategies for Safer Schools” produced for the Maine Department of Education. School Sexual Assault Part of a Game? School Security Expert Tip - Write it down! What are incident specific protocols? What are the benefits of a security camera system? How can school staff prepare for a crisis? How does mental simulation help school staff? Why is a culture of safety important for schools? Why is student supervision so important? Are there ways to prevent school shootings? What is a targeted act of violence? School Safety Terms – What do they mean? Is this really ADA Accessible? Do Your Practices Match Your School Safety Plans? Do your practices match your procedures? Who Should Make The 911 call? Is your School Staff Trained to Spot Tornadoes?